The Advanced Spanish-Catalan Catalan-Spanish Dictionary from Enciclopèdia Catalana, with 219.000 senses, contains the richest, most complete and most updated couple of dictionaries between these two languages. And you can change from one to the other with one click! Launch price: 27.99€! (price of the paper dictionary: 69€). 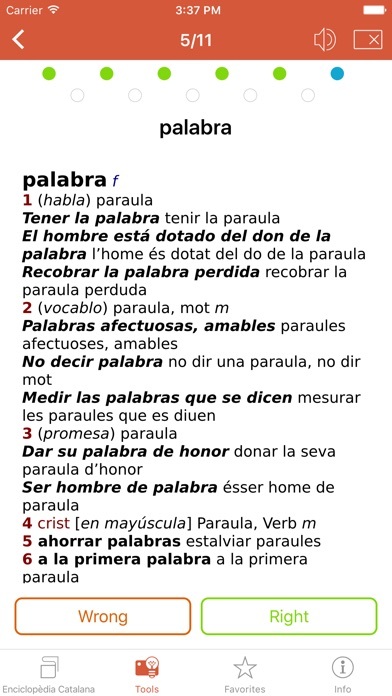 It includes also the verb conjugation in Catalan and Spanish. _____ Dictionary details: Spanish-Catalan – 58.000 entries, 114.000 senses, 18.000 phrases, idioms and proverbs, 15.000 examples of use – 2.400 historical, mythological, person and place names Catalan- Spanish – 56.000 entries, 105.000 senses, 17.000 phrases, idioms and proverbs, 15.000 examples of use – 2.200 historical, mythological, person and place names Ideal for solving doubts and translation problems that may arise in the transition from one language to another, in a clear, practical and comprehensive way. _____ Search and input features: • New for iOS 9: You can now look up words while reading news, email, Safari sites, messaging or other popular apps! Select any text and send it to the dictionary via the “Share” button. All words available in the dictionary will be highlighted. To activate this feature, please select the dictionary as a sharing 'extension'. • New multiple clipboard look-up! You can now copy as many words as you need while reading – even the whole text, - switch back to the app and view all the relevant dictionary entries one-by-one. • Full text search feature allows you to look up words more efficiently throughout the whole dictionary content, including headwords and usage examples. • Improved browsing capabilities through word list and Search History. • List of similar words in case of misspelling. 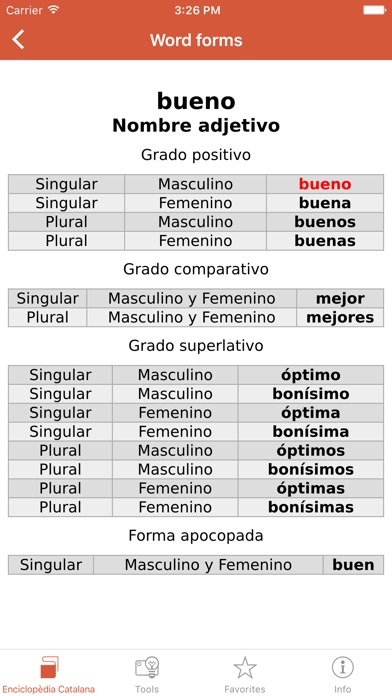 • Morphology module helps to find words in any grammatical form (for English, Spanish, Catalan and French). • Wildcard Search if you are unsure of the exact word spelling. Use “?” and “*” symbols to replace the missing letters. Learning features: • Search for anagrams. 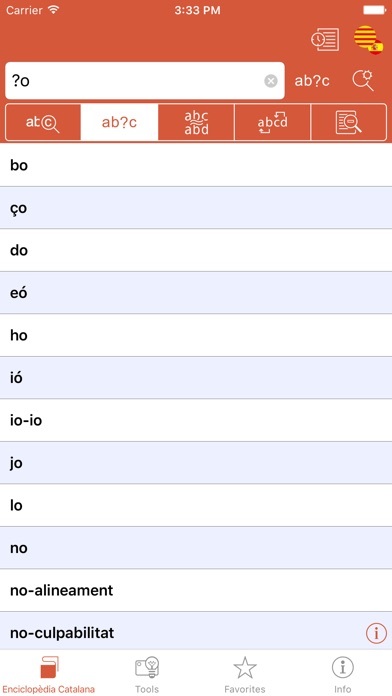 • Audio pronunciations recorded by native speakers (for English, Spanish and French). • Flash Card Quiz enables you to add new words to flash cards and test your knowledge as many times as you wish. Interface features: • New! Graphics fully adapted for iPhone 6 and iPhone 6 Plus. • New! App startup has got 3 times faster! • Enhanced customization options allow you to modify animated menus and choose background colors. • Enlarge or reduce font size for your comfort. • Search History can be browsed through or deleted in full. • Favorites - to quickly access frequently searched words. • Handy Converter support. • Hyperlinks between articles and directions. • Landscape-mode support. • Fully iPad optimized interface. 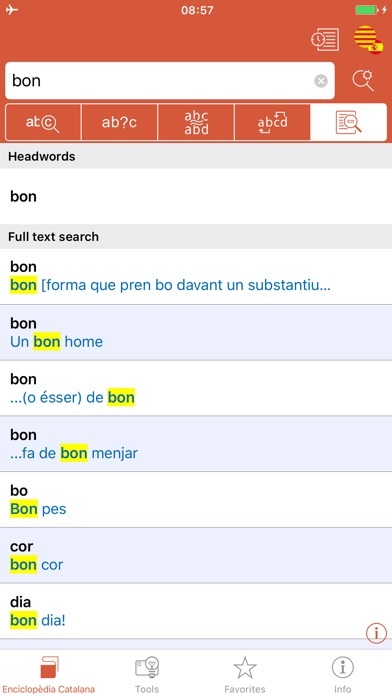 • Catalan interface localization. • No Internet connection required: simply download the dictionary once and use it on your iPhone/iPad/iPod touch without any additional expense. _____ About Enciclopèdia Catalana (www.diccionarisdelenciclopedia.cat): Other dictionaries of Enciclopèdia Catalana now available for your iPhone, iPad o iPod touch: • Diccionari avançat de la llengua catalana (Advanced Catalan Dictionary) • Diccionari manual Català-Anglès Anglès-Català (Compact English-Catalan Catalan-English Dictionary) • Diccionari avançat Català-Castellà Castellà-Català (Advanced Catalan-Spanish Spanish-Catalan Dictionary) Enciclopèdia Catalana has a catalog of nearly 100 titles, including monolingual dictionaries of Catalan and the main collection of bilingual dictionaries between Catalan and other languages, as well as thematic, encyclopaedic and complementary Catalan dictionaries. 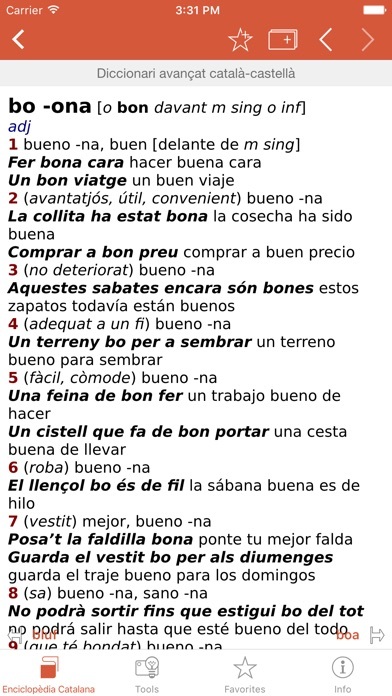 SPANISH: Aunque muy útil para el que lo necesita, podría ser mejor. Por el momento, no tiene audio en catalán, y solamente algunas palabras en castellano lo tienen. Esto no es una gran limitación para su uso (siendo igual al libro) , pero considerando que incluye tarjetas para aprender las palabras y tal, realmente lo convertiría en una herramienta considerablemente más útil tanto para aprender como para su uso en general. Como nota adicional, estaría bien el poder saber cuál es la variante balear o valenciana. En resumen, es una referencia práctica y útil para el que la necesita. Para mi ha sido mucho mejor que cargar con los mamotretos (y es más económico). --- ENGLISH: Even though it's quite useful for those who need it, it could be better. As of this writing, it has no audio in Catalan and only a limited amount of words with audio in Spanish. This isn't necessarily a limiting factor in terms of its usefulness (being more like the book itself), but considering it has flash cards for learning and what not, it would really make it a considerately more useful tool both in terms of learning the words and in its general use. Additionally, it would be nice to know which are the Balearic and Valencian variants. In conclusion, it is a reference that is practical and useful for those who need it. For me, it's certainly been much nicer than carrying the books (and it's cheaper).